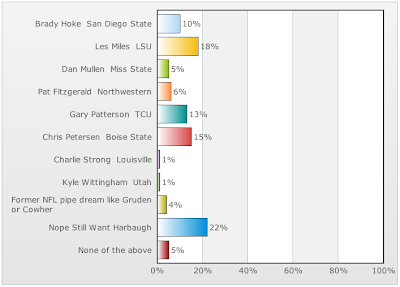 Well over 1,000 votes (1,110 as of 11:35AM) have been cast in our very unscientific poll in which we asked you, Michigan blog reader guy, who the next coach at Michigan will be. I tried to include any and all names that I've heard over the last 24 hours as possible candidates. Of course, there are some names out there that are not on this list, but I think we've narrowed it down pretty good. Here's how the citizens of Maize & Blue Nation voted. Some interesting things to take away from this poll. 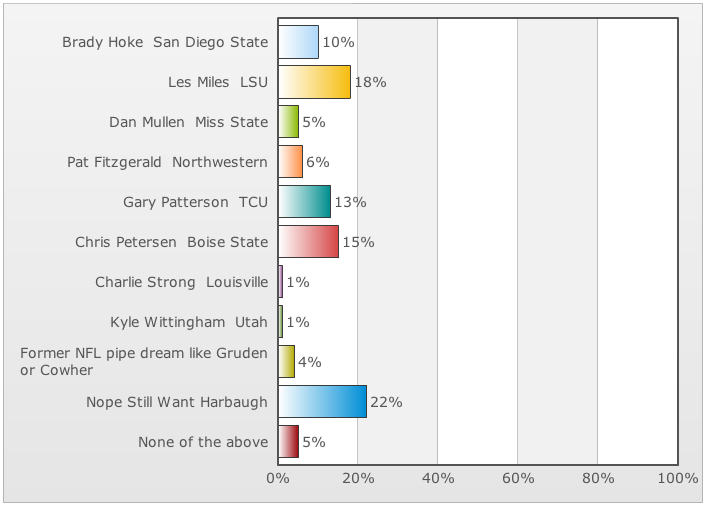 Both TCU's Gary Patterson and Boise State's Chris Petersen got more votes than I thought they would. Not to say they don't deserve the attention. Both of their programs have enjoyed a ridiculous amount of success in non-BCS conferences, while knocking off very good teams from BCS conferences. 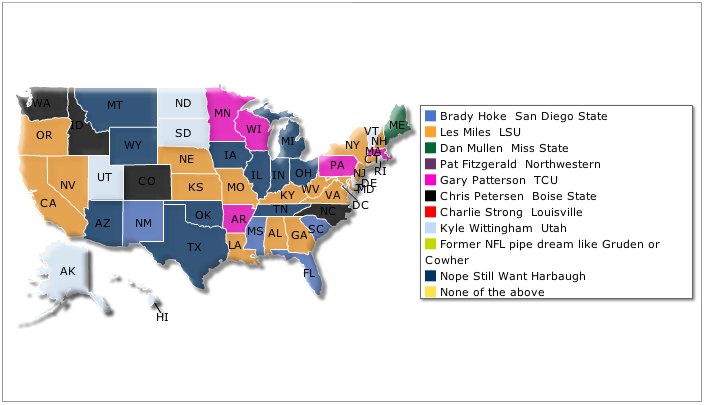 I thought Brady Hoke would receive more love, but I can see why he didn't. And on the flipside of that coin is the amount of people still holding out hope for Jim Harbaugh. By far and away two names in this poll who were the fan favorites are the ones that would most easily fit the criteria lined out by Dave Brandon during his press conference yesterday. And those names were Les Miles and Jim Harbaugh. I firmly believe that both Harbaugh and Miles are very good coaches, and would likely do very well at Michigan. But both could potentially drive apart these factions that exist in the Michigan fanbase. Harbaugh has a lot of support right now, but he also has his critics due to his comments he made a few years ago about the academic standards for Michigan football players. Miles is a polarizing kind of figure. You either really like him, or don't like him at all. Among the rest of the names, no real surprises. Pat Fitzgerald is a unique possibility. He's a proven coach, a proven leader, but not necessarily a proven winner (at least on the coaching level). But his passion and ability to inspire (and his youth, let's face it) have made it possible for him to make a name for himself. But hey, these names are just ones I picked out of thin air. What say you? Post your thoughts in the comments section. I think at this point, there's no such thing as a possibility too crazy. I agree that both Harbaugh and Miles would continue the splintered Wolverine Fandom, but I think any coach will at this time. The hiring of RR will go down as the day the (mostly united) M fan community died. Harbaugh would probably be the closest to getting everyone back on board, but certainly not completely. Miles, not so much. Hoke, et al, would continue what we have now. The only fix is a number of very successful seasons. And that may not be enough. I think Miles or Gruden would be the best bet do to being good defensive coaches. Harbaugh would have been ideal in bringing Bo's style of smash mouth football back to Ann Arbor, but to be honest, there just aren't any solid coaches out there and even less who would be willing to try & restore our beloved winning tradition. Brady Hoke in my book is not ready for that either.